Sippy cups are now made so that they are essentially indestructible. They are spill proof even when thrown down several stairs, across a room or probably out of a moving car. 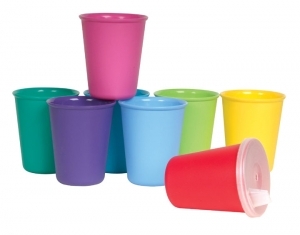 I grew up drinking from an open cup that sometimes had a lid made by Tupperware - similar to the picture above and it did the job. Mostly because if I did spill I was sitting at our kitchen table - not walking around the house with it. 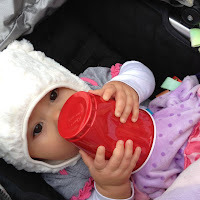 Sippy cups are fabulous in their new designs, however families seem to have really listened to the marketing campaigns. They now feel like if they buy the best spill proof sippy cup out there then they don't have to worry about their children as they walk around the house drinking throughout the day. Somehow families have fallen for the mindset of, "I must keep my child hydrated at all times and the best way to do this is to allow them access to liquid during all waking hours". What happened to encouraging children to sit at a table to eat and drink? Encouraging them to communicate their wants and needs? "Mommy/Daddy, I am thirsty" -or- "Eliana are you thirsty? 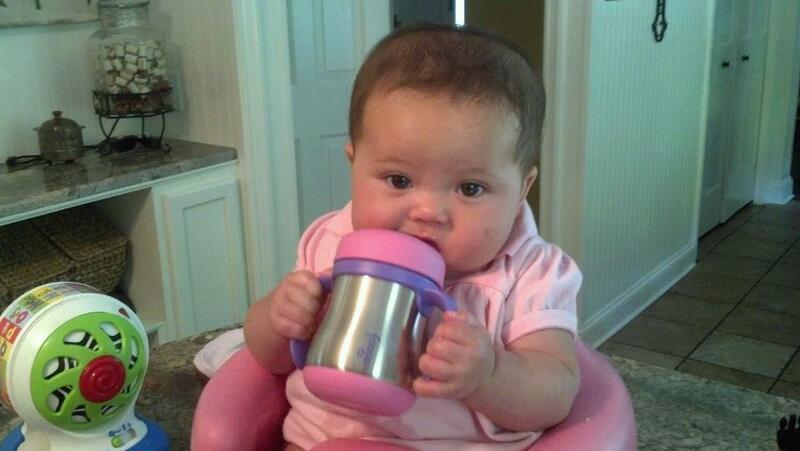 Let's go get some (water/milk) in the kitchen". Why would a child ever want to take a break and sit at a table for a meal when they could instead leisurely take their time taking small sips of milk between building with Lego's or playing with dolls. So do we only own prehistoric sippy cups in our house? No. We have an embarrassingly large multitude of drinking devices, some of which are spill proof and some of which are not. BUT, we do encourage eating AND drinking only in the kitchen when at home.